I have this app on iOS called Capti. It's a pretty straightforward but extremely helpful tool that reads any text you throw at it using text-to-speech. You can point it a web pages or articles or ebooks or documents, set a voice, and it'll read it for you. As a result, I've started using it to listen to ebooks that I don't have an audiobook version of while I drive to and from work. The drawback of this is that Capti doesn't show you the text while it's reading it like some desktop text-to-speech readers do, so it's hard to find my place if I want to pick up the ebook and read when I can't listen to Capti. Which is where this little tool comes in. 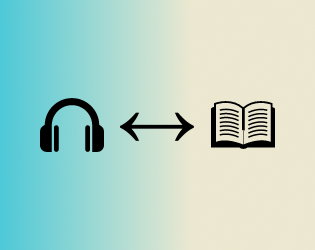 It estimates the page position based on your position in the overall audiobook so you can pick up reading right away without having to scour the book for a familiar phrase! And then when you're done reading, you can pop your page number back in, and it'll spit out your approximate position in the audiobook! I even added a couple of "fine-tuning" fields to help account for some books and audiobooks that don't necessarily start at the exact beginning. I offer this tool to anyone who stumbles upon it. Hopefully it can be as helpful to you as it has been to me!